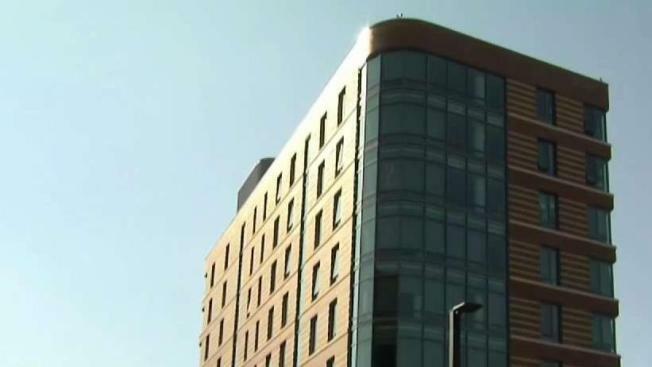 It has not been open a full semester since students moved in to the first-ever dorms at UMass Boston, and already they are complaining that the brand new buildings are plagued with problems. The towers house more than 1,000 students and cost $120 million, according to the school’s website. Now just two months after the ribbon-cutting for the major milestone, students are calling the construction into question. The issues, according to the student residents, include water leaks or no hot water at all, dining hall food that they argue is undercooked and elevators that drop suddenly. Students are also criticizing the security. One of the residence halls features a first floor that is open to the public, but they said non-residents are easily getting past the entrances that lead up to the floors. “It kind of feels unsafe because one day there was just this random person walking around,” freshman Pauling Galvez said. Interim Chancellor Katherine Newman sent a detailed letter after the issues were first reported in the Boston Globe and said the school is taking immediate action. She said the elevator issues have been resolved, but she is having another meeting with the builder and operator to address the work that still needs to be done. School officials said safety is a top priority, which is why they are adding uniformed guards at the entrances. They are also hosting floor meetings Tuesday night for students to review security measures. The school is also launching a committee that students can join to discuss the food quality and other ways of improving on campus housing.